he Catawba Crapemyrtle is a small shrub like tree that has bright green foliage in the summer that change to orange-red in the fall. 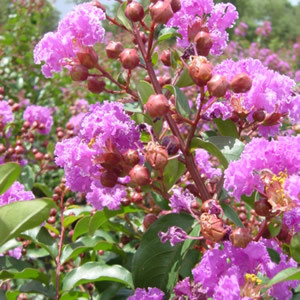 Lagerstroemia indica ‘Catawba’ has long lasting deep purple flowers in the summer months, and is one of the best purple flowering selections available. Catawba is mildew resistant and grows up to 12 feet tall.